Unwavering and brutal; this is the brand of dissonant death metal that New Zealand's Ulcerate has been putting out since their inception. Yet, these descriptors always seem to fall short of fully portraying the devastating nature of the band's sound. The Destroyers of All, the band's 2011 release, set an amazingly high bar, but with Shrines of Paralysis, Ulcerate's death metal chops - along with their dialed in songwriting sensibilities - culminate into what could quite possibly be their most complete offering to date. The biggest draw to Ulcerate is how they take technicality and discordance and wrap the two together with an unshakable ferocity. Shrines of Paralysis wastes no time in unleashing this ferocity with the opening track, "Abrogation". Courtesy of Jamie Saint Merat, who is unquestionably one of the most talented drummers in the metal scene currently (evidence here), a deluge of blast beats are accompanied by ever-evolving guitar riffs and vast guttural growls. I can't remember ever wanting to avidly yell "annihilation" at the end of a song before, but "Abrogation" makes me realize how much I've been missing out. 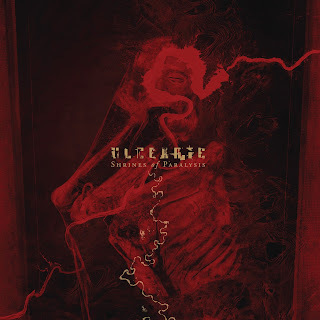 I would normally go more in-depth about the subsequent tracks, but Ulcerate is unique in that they are nearly impossible to judge on an track-by-track basis. Aside from "Extinguished Light", which is easily the closest thing the band has ever had in terms of a hit single, Shrines of Paralysis, like all of their previous work, stands taller as a full album experience than it does as a compilation of individual tracks. A full Ulcerate album experience is best characterized by the oppressiveness that envelopes you as a listener. Both tonally and lyrically, the band paints a bleak picture; but one that is simultaneously awe-inspiring. One line from the album's title track stands out, in particular: "All that remains from the burdens of flowing blood are expanses of dust." Despite how "alive" the music itself feels, whether it be from its technical proficiency or its unforgiving heaviness, in the end it leaves you empty and drained. Shrines of Paralysis is an exclamation point for Ulcerate's career. It takes the barbarous nature of their sound and puts in a more polished setting; ultimately making it more audible and powerful. The album's fast pace drives you through an experience that is varied, bleak, catchy, and heavy all at the same time. They may not have changed their formula up too dramatically form their past endeavors, but Ulcerate continues to prove that there still aren't enough combinations of adverbs and adjectives to accurately convey the level of heaviness they deliver.